Stroke exercises are our specialty, and these are our best arm and hand exercises for stroke recovery. Before we get into the moves, we’ll first discuss what makes an exercise “the best.” Then we’ll provide our top 3 hand and arm exercises. And finally we will discuss our rehab tool that can help improve hand function in just 2 weeks! When you’re looking for the best exercises for stroke recovery, you’re probably looking for ones that improve movement the fastest. Some patients equate ‘best exercises’ with ‘fastest improvement,’ but that’s not how you should think about it. In order to regain movement in your body as fast as possible, you need to rewire your brain through neuroplasticity. And the best way to engage neuroplasticity is by completing a high number of repetitions during your rehab exercise. It doesn’t matter which exercises you do, per se. What matters most is that you’re doing them consistently with a high number of reps.
As long as you’re doing each exercise correctly and consistently with a high number of reps, then you will be getting the BEST results possible! And in this case, correctly means without compensation techniques, like hiking your shoulder. So don’t stress about knowing the “perfect” hand and arm exercise sequence to do. All you need to focus on is getting your reps in and doing them right. With that said, let’s get into the exercises. These 3 arm exercise progress from easy to hard. See which ones you benefit from most, and then do more exercises from our stroke exercise guide at that difficulty level. Place a water bottle on top of a table. Then, lace your fingers together and wrap both hands around a water bottle. Then, make large circular movements with your arms. As you move around in this big circle, focus on really stretching your affected arm. Perform 10 big, slow circles. Place a water bottle on the left side of the table within your range of motion. Then, hook your wrist on the outside of the bottle. Then, use your arm to push the bottle across the table. If you can do this without moving your body, great! If you need to move your body to accomplish this task, then that’s okay. You’re still retraining your brain and working on regaining arm movement. 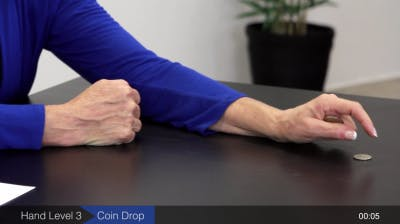 When you’re done, hook your wrist on the other side of the bottle and push it back across the table. Repeat this back and forth pushing a total of 5 times. Sit comfortable and hold a water bottle with your affected hand. If it’s too heavy, try the exercise with no weight and work up from there. For the exercise, keep your elbows glued to your sides at all times. 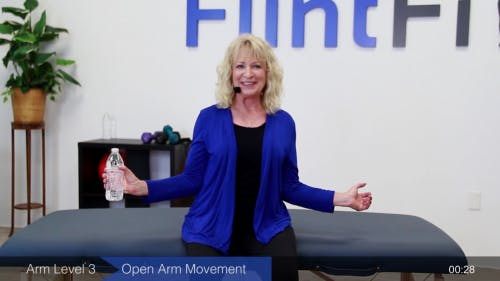 With your arms bent at 90 degrees, open your arms up so that your forearms come out to your sides. Really focus on squeezing your shoulder blades together when your arms are opened up the widest. Then, move your arms back to center. All of these exercises are pretty challenging. So if you can’t do them, don’t be discouraged. Try them “passively” by using your non-affected hand to assist your affected hand. Passive exercise still helps engage neuroplasticity and rewire your brain! 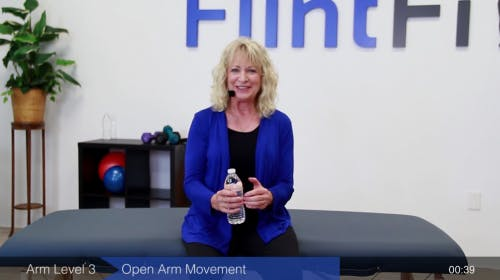 Place a water bottle in your hand with your forearm on a table. Don’t grip the bottle. Keep your hand and fingers relaxed. Then, grip the bottle and curl your fingers in – kind of like a bicep curl, but for your hand and wrist! Repeat a total of 5 times. Place a pen on your table and then spin it using your affected thumb and fingers. Try not to let your shoulders engage in this movement. You really want to isolate your thumb and fingers. Try to aim for speed during this exercise if you can. Spin the pen quickly for 15 seconds. Start by placing 8 quarters in the palm of your affected hand. 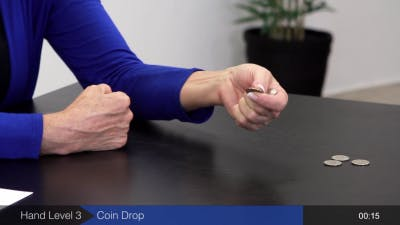 Then, use your thumb to slide one quarter into your index finger and thumb, so that you’re pinching the quarter. Then, place the quarter down onto the table while keeping the other quarters in your hand. Repeat and place each quarter down on the table one by one. This last exercise is very difficult, so give yourself a nice break at the end. Tabletop exercises are a great way to improve hand function, but…. If you’re looking for something that’s clinically proven to work better than tabletop exercises, then take a look at MusicGlove. It’s a our award-winning hand therapy tool that motivates you to complete a high number of reps through a therapeutic, musical game. And when we say high reps, we’re talking hundreds of reps per session. Which, as you know, is the formula for hand therapy success.